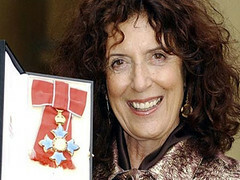 Anita Roddick, founder of the Body Shop, passed away a couple of days ago. I know lots of people have been turned off by the Body Shop in the past few years, annoyed at how many there are (almost as ubiquitous as *that* coffee shop), the fact that it appears to be like any other commercial enterprise now, and especially cynical about its decision to be bought out by L’Oréal, which tests on animals and is part-owned by Nestlé. But still. You have to admit that receiving one of those gift packs of body butters is quite a treat. And the Body Shop is still an ethical choice for your products in many ways. And that is one of her most important legacies: Anita Roddick helped make ethical consumption fashionable and mainstream before being green was really quite cool. I started The Body Shop in 1976 simply to create a livelihood for myself and my two daughters, while my husband, Gordon, was trekking across the Americas. I had no training or experience and my only business acumen was Gordon’s advice to take sales of £300 a week. Nobody talks of entrepreneurship as survival, but that’s exactly what it is and what nurtures creative thinking. She was a tireless campaigner: for the environment (with Greenpeace and Friends of the Earth) and human rights (with Human Rights Watch and Amnesty International), and against the WTO, corporate globalisation, animal testing and Exxon-Mobil. Ruby was a fun idea, but she carried a serious message. She was intended to challenge stereotypes of beauty and counter the pervasive influence of the cosmetics industry, of which we understood we were a part. Perhaps more than we had even hoped, Ruby kick-started a worldwide debate about body image and self-esteem. It was so successful that Barbie actually got mad! But Ruby was not universally loved. In the United States, the toy company Mattel sent us a cease-and-desist order, demanding we pull the images of Ruby from American shop windows. Their reason: Ruby was making Barbie look bad, presumably by mocking the plastic twig-like bestseller (Barbie dolls sell at a rate of two per second; it’s hard to see how our Ruby could have done any meaningful damage.) I was ecstatic that Mattel thought Ruby was insulting to Barbie – the idea of one inanimate piece of molded plastic hurting another’s feelings was absolutely mind-blowing.